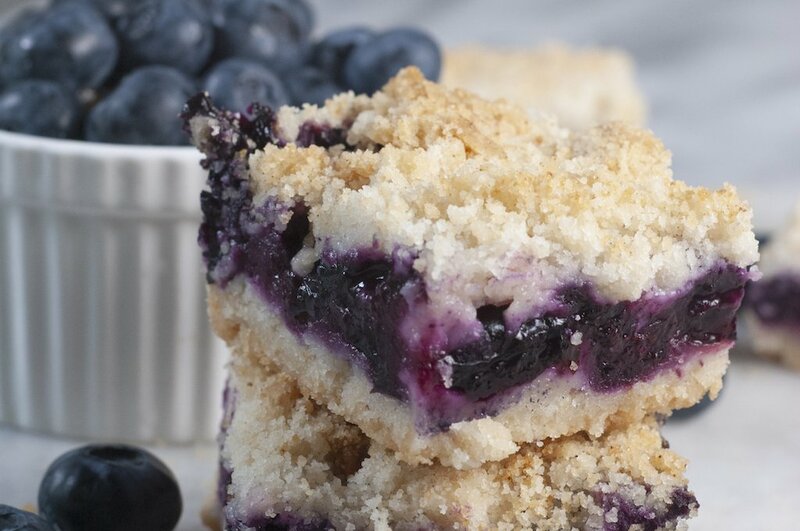 Celebrate blueberry season with these easy vegan blueberry squares. Fresh blueberries are best, but frozen will work in a pinch. You can substitute your favorite berry if blueberries aren’t your thing. You know what I love? I love easy dessert recipes that use a minimal amount of dishes. That is why I love these vegan blueberry squares. If you have a food processor, you can whip these up and have them in the oven in 10 minutes flat. Of course, then you have to wait for them to bake and cool but you will survive. I believe in you. I’ve made this recipe vegan by using aquafaba in the place of egg whites and Earth Balance shortening sticks instead of butter. If you eat butter and eggs, you can swap those things back in using the same quantities. 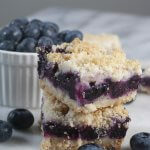 This recipe is adapted from this Blueberry Crumb Bar recipe on Smitten Kitchen (she adapted it from Allrecipes.com). I downsized the recipe a bit to suit the needs of my household (only 2 of us). 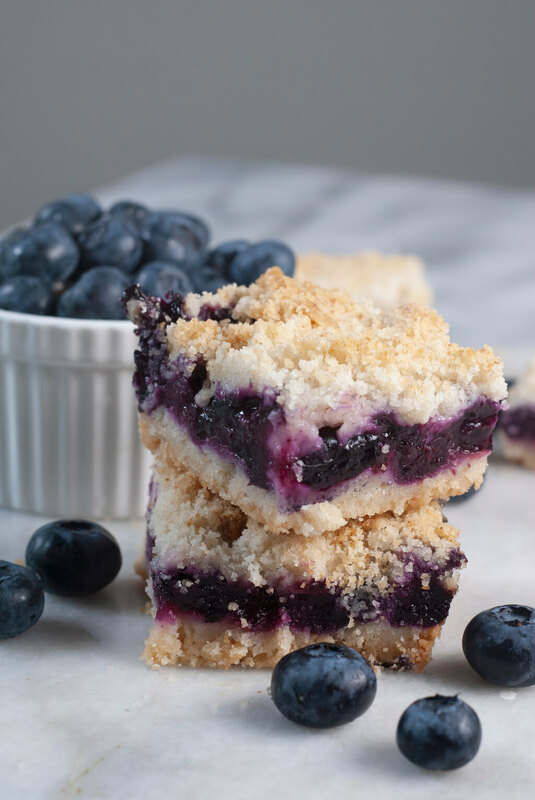 These vegan blueberry squares pair well with a scoop of non-dairy ice cream, but they also stand alone as a tasty lunchbox treat. Grease an 8×8 pan with shortening. In a food processor, combine the first ⅔ cup sugar, baking powder and flour and pulse a couple of times to combine. Add the shortening to the processor and pulse 10 times to distribute . Add the aquafaba and lemon zest and run the processor until it forms a sandy mixture. It will be very, very, crumbly. Don’t worry. Press half of the mixture into the greased pan using your fingers. Make sure the bottom is completely covered. Use a little pressure. Set the remaining crumble mixture aside. 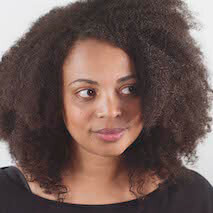 In a medium bowl, combine ⅓ cup of sugar and 2.5 tsp of cornstarch, whisk it around to distribute the cornstarch evenly. Add the lemon juice and stir. Add the blueberries and gently stir to coat them with the sugar mixture. Pour this mixture into the pan on top of the first layer. Spread it around evenly. Spread the remaining crumble evenly over the top of the blueberries. Press down on it lightly to make it stick. Bake for 45-55 minutes. Is should be bubbly at the edges and slightly brown on the top. Remove from the oven and let it cool completely before cutting.